Active, outdoor fun for younger children, day or night. 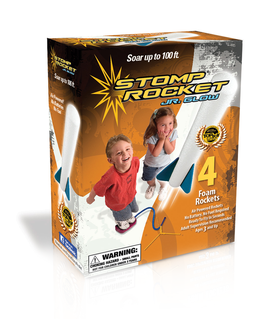 Run, Jump, STOMP to launch glow-in-the-dark rockets up to 100 feet in the air. Daytime and nighttime fun. 100% kid-powered. Super easy, fast assembly. 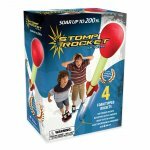 Includes 4 Jr. Glow Stomp Rockets, Launch Stand, Launch Pad with Air Hose. Foam-tipped glow-in-the-dark rockets fly up to 100 feet in the air. Fun for solo play or take turns with 2-3 kids.